Not long ago, there was a posted tutorial outline for removing the popcorn from a ceiling. After all, ceiling popcorn is about the most useless (not to mention ugliest) decoration ever. As effective as that tutorial is, some of you might not want to get messy scraping off the old and repainting the new. Or if your house was built in the 1950’s, scraping off popcorn means dealing with asbestos. Not fun. Well, I have some great news! 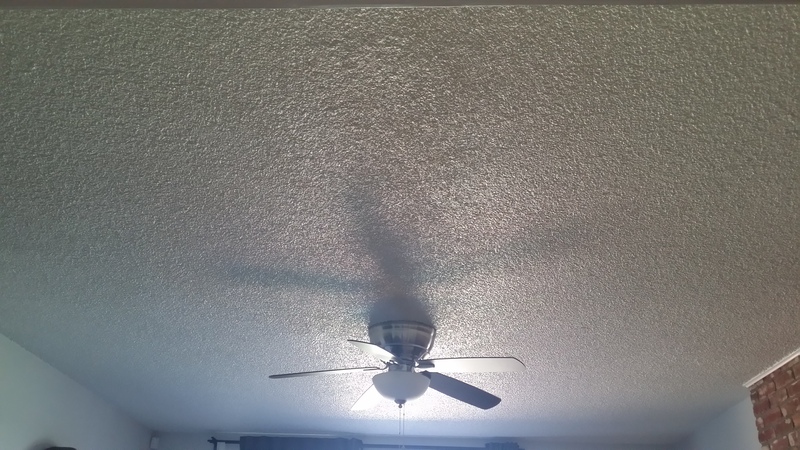 Imgur user, makesomething, chose a different way to handle the ceiling popcorn in a room in his 1950 home. Here’s the thing, they didn’t even bother removing the popcorn at all! Their ceiling popcorn had been painted over three times beforehand, so they decided to handle things differently. Removing all those layers would be too much of a hassle. They bought some wooden planks from Lowes, spending about 9 dollars per six pack. They also bought 2 inch brand nails, which they used to nail some planks to the joists in the ceiling. They used a stud detector to find the joists and chalk to mark the spots. The planks they chose had V-shaped grooves in the ends, making them blend seamlessly. Altogether, the wood planks cost about $250, which they had some left over. Next came the moulding, which cost about $120. It’s a beautiful method for covering the edges of the outer planks. Two days and $370 dollars later, a brand spankin’ new and far more stylish ceiling! However, if you want to save money, you could always use wooden pallets! They even had extra planks to decorate one of the walls. All that’s left for them to do is stain the wood. As with most good DIYs, this one has been puppy approved.